2. Add cookies to a food processor and pulse several times. 4. In a greased spring-form pan (or a tart pan), add cookie crumble to base and up the sides about 3/4 of an inch. Poke some holes in the bottom with a fork. 5. Bake the crust for about 8 minutes, or until golden. Remove and allow to cool. 6. In a small saucepan, bring coconut cream to a boil. Remove from heat and pour in chocolate chips. Wait 5 minutes, then mix well until chocolately smooth. 7. Stir in crushed peppermint and optional bourbon. If omitting both, skip this step. 8. Pour chocolate into the crust and place in the refrigerator for 2-3 hours. 9. Remove from the fridge and top with crushed peppermints and allow to thaw out for about 15-20 minutes before serving. *I most frequently use Midel's Gluten Free Gingersnaps. For this specific bake, I used some of the test cookies from this gingerbread cookie recipe I made myself. I haven't really had any cookie fail me in this recipe. I've even used snickerdoodles! 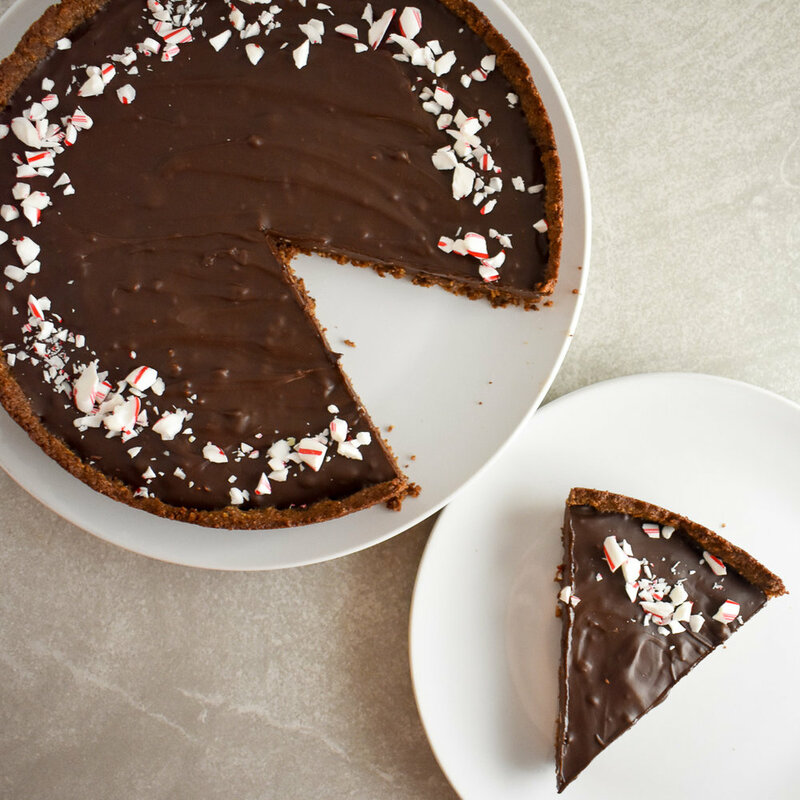 **When I do not use the candy cane, I usually top this tart with berries!